What are the check-in times for eighth grade applicants taking the entrance test at Saint Mary’s? Students WITH EXTENDED TIME will begin their exam promptly at 8:00 a.m. with check-in beginning at 7:30 a.m. in our gymnasium. Extended time is granted for students who have learning differences and have submitted a copy of their official documentation report by a licensed professional BY EMAIL OR MAILED to Saint Mary’s by January4, 2019. Students WITHOUT EXTENDED TIME will begin their exam promptly at 8:30 a.m. with check-in beginning at 8:00 a.m. in our gymnasium. What is included on the test? language achievement, such as punctuation, capitalization, spelling and composition. If my child is taking the exam at Saint Mary’s, what does he or she need to bring to the exam? Students do not need to bring any materials to the exam; Saint Mary’s will supply all items for the exam, including pencils and scratch paper. We do encourage students to bring something to read quietly as he/she waits for the exam to begin. CALCULATORS ARE NOT ALLOWED. Student’s cell phones will be required to be silenced and not visible during the exam. The cost of the exam is included in the Saint Mary’s application fee. Each Catholic high school sets their own application fee. If a student is applying to more than one Catholic high school, they must pay the application fee at each high school, whether they are testing there or not. How long is the test and will my child have a break? The HSPT is a two and a half hour test. Students will have a 15 minute break halfway through the test. There will be snacks available for them during break. Saint Mary’s allows time for the test proctor to go over directions with the students, for filling out the answer sheet, and for general test instructions. The total time of the test is approximately 3 hours. Students with extended time will be longer. How can students prepare for it? Since this test reflects eight plus years of learning, the best way to prepare for the HSPT test is for students to focus and pay attention in class, do all their class work, homework, and bottom-line, take their your eighth grade studies seriously. Students should ask their teacher(s) if he or she has plans to offer any type of test review for the class and what students can do to review basic math and English skills prior to the test. Will you accept other test scores in place of the HSPT? Saint Mary’s requires that all students take the HSPT exam unless they are coming from out-of-state and/or the HSPT exam is not available where they currently reside. When appropriate, comparable, standardized testing results will be accepted. Will families receive copies of the test scores? Students taking the HSPT test at Saint Mary’s will receive a copy of their test results along with their admission decision. How important are the test results to the admissions process? The test results are important and students should take them seriously, as they help us to evaluate and measure a student’s potential for academic success in a college preparatory high school environment. The test results also provide us with information about honors admission and/or honors course placement. Is there an opportunity for accelerated placement testing? 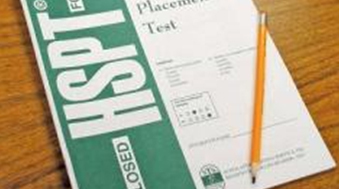 An applicant’s HSPT test results are not the sole basis used to appropriately place freshman in their academic classes and/or accelerated courses. Saint Mary’s administers subject placement testing on April 2019 for those registered freshman who wish to be scheduled for a higher course placement in math, English, international language, and certain Visual and Performing Arts. The subject placement tests in May allow students the benefit of completing the majority of their coursework in a particular subject area so that they are able to effectively demonstrate their comprehension and knowledge. There is no fee for a student to take the subject placement tests. Students will be notified of their results by the Saint Mary’s Academic Office.